Advent Software, Inc. (ADVS) recently hit a new multi-year high after rebounding from a long-term trend line in late August. With a bullish next-year estimate of 28%, this Zacks #1 rank stock looks like a solid momentum player. Advent Software, Inc. provides software and services that help investment management organizations communicate both internally and with outside parties. The company was founded in 1983, operates in the US, Europe, Middle East and Africa and has a market cap of $1.5 billion. Although ADVS has seen big gains over the last year, its share price got an extra boost on July 26 when the company reported solid Q2 results that came in ahead of expectations. Revenue for the period was up 10% from last year to $69 million. Earnings also came in strong at 22 cents, 5% ahead of the Zacks Consensus Estimate. The company reported a number of encouraging trends in its business, with its renewal improving to 90%, a 5 point increase from last year. It also noted that it continues to expand its global footprint, with international sales now accounting for 15% of revenue. Advent also announced the opening of an office in Singapore, reinforcing its commitment to penetrate Asian growth markets. In a nod to its confidence in its business, Advent bought back 555,000 shares during the quarter at an average price of $43.02. Advent also has an awesome balance sheet, with cash and equivalents of $43 million and no debt. Estimates didn’t exactly rip higher off the good quarter, but we did see upward movement none the less, with the current year adding 3 cents to 94 cents and the next-year estimate gaining 5 cents to $1.20, a 28% growth projection. After the big gains of the last year, ADVS doesn’t come cheap, trading with a forward P/E of 56X against its peer average of 28X. ADVS recently hit a new multi-year high after rebounding from a long-term trend line in late August. 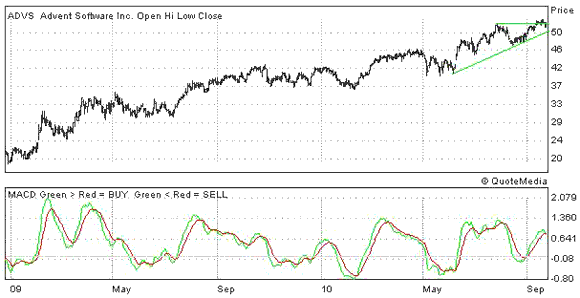 The MACD below the chart is bullish, with the short-term average trading ahead of the long-term average. Look for support from the trend line and the short-term low on any weakness.